Oh, you are going to love this book. I'm great in it - really brave. You're smart to read this. 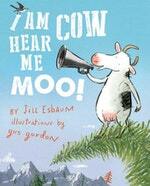 Not as smart as me, of course, or as brave, but then, I am cow, hear me moooooooo! Best-selling author, Jill Esbaum, and fantastic illustrator (author), Gus Gordon, team up for this funny and oddly reassuring rhyming romp about the brilliantly brave . . . Nadine the Cow. Nadine is a 'truly remarkable cow' who is afraid of absolutely nothing; or so she claims. She's a bit of a show-off, really, and when her friends take her up on her offer of a tour through the woods, Nadine is in her element. Then night falls, and when her friends leave and Nadine is left to explore a dark cave all on her own, suddenly she doesn't feel quite to brave after all. Love I Am Cow Hear Me Moo? Subscribe to Read More to find out about similar books.